Among other reading challenges that I have taken on, I am working my way through my box set of Penguin’s Little Black Classics. Reading and reviewing these are sure to be a different experience, given their short and sometimes excepted form. But who doesn’t love a box set? 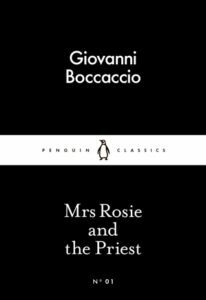 Mrs. Rosie and the Priest by Giovanni Boccaccio is a collection of four short stories by a well-noted Renaissance writer in the 1300s. The stories are written in a Florentine frame structure, all with consistent themes and designed to pass the time. It’s difficult to summarize the plot for each story, since they are all very concise and spoilers would abound. But a few of these takeaways may help set the tone. Love, travel, and corruption reign supreme in these tales, and these are by no means innovative. But what I found intriguing for such an old text is how relatable the language was, how candid characters seemed, and how current their content seemed. The language in some cases was quite striking: “The judge took her home with great razzmatazz”. Characters are motivated by greed and sexuality in clear tones similar to how we talk among ourselves today. As the back cover makes clear, the stories depict illicit and bawdy folks, quite up to no good. “The good priest, who was hard pressed by his loaded weapon”. Point taken, Boccaccio. Well done. All four of the stories read like parables, and it was clear that Boccaccio had lessons to share and from which we are to learn. The stories tell of the danger that comes of being too trusting of others and of the pitfalls to avoid, even when it comes to the clergy. Naive men are conned by clever women into losing their money (and their pants). Priests attempt to take advantage of married parishioners. I found it interesting when looking into the history of this collection that other writers have often turned to Boccaccio’s works (including Shakespeare, Moliere, Chaucer, and Poe) who also used their works to make an impression on readers (and in quite varied fashion). Mrs. Rosie and the Priest is approachable as a classic and a great foray into Renaissance short-form fiction. You do need to read between the lines occasionally, but the collection is accessible and worth the time (especially if you are reading your way through the box set as I am). Great for anyone looking to try a new spin on classic literature in a manageable size. I am not typically a fan of short stories, but this collection was short enough that I was able to give it the attention it needed for me to find the content of value. The time period also interested me in contrast to more modern collections. I am interested to learn more about Boccaccio, as these four stories are excerpted from his The Decameron, which includes 100 stories. And if ye olde tales about trickery and debauchery are not your cup of tea, don’t let this first text out of 100 in the box set deter you. The subsequent books certainly vary in content.